In a Steam update Saturday, Rocksteady shared their plans for fixing the flawed PC version of Batman: Arkham Knight. 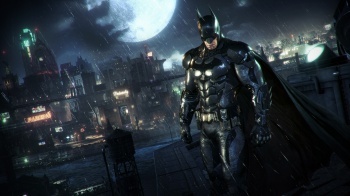 The June 23rd release of Batman: Arkham Knight immediately presented issues for PC gamers. Following a day's worth of complaints, and an extremely negative feedback score, the game was pulled from Steam until the issues were resolved. "Rocksteady is leading our team of developers and partners as we work on the PC performance issues that players have been encountering," Warner Bros' Gary Lake-Schaal wrote in a Steam update Saturday. "The work is significant and while we are making good progress on improving performance, it will take some time to ensure that we get the right fixes in place." The primary areas of focus include addressing bugs that affect texture and performance, improving the system memory, fixing NVIDIA and AMD bug issues, and what was one of the most frequently cited complaints for fans, support for frame rates above 30FPS. Fixed a bug that caused the game to crash when turning off Motion Blur in BmSystemSettings.ini. A future patch will enable this in the graphics settings menu"